The Power of The Scarlet Witch! 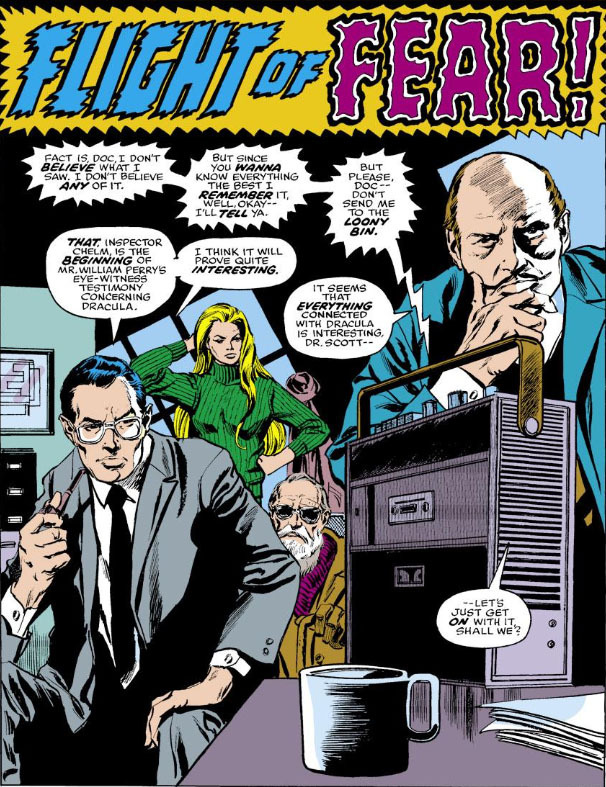 OR: "Three Strikes, You're Out"
With The Avengers in late 1974 getting cranked up for the Celestial Madonna storyline, writer Steve Englehart has cut the assemblers no slack, keeping them busy with not just their own affairs but two crossover stories with both Fantastic Four and Captain Marvel. 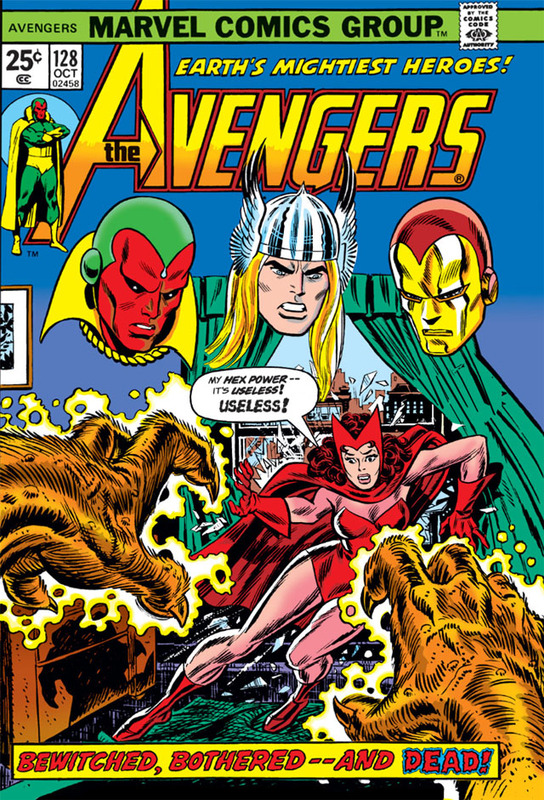 In just the previous four issues we've seen a planetary menace in the form of the Star-Stalker; a confrontation in space with the forces of Thanos; a deadly hostage situation involving the master of sound, Klaw, and his accomplice, Solarr; and a wedding in the land of the Inhumans that was crashed by none other than Ultron. But before Kang the Conqueror comes knocking pounding on the Avengers' door seeking the Madonna, a candidate for that honor faces a crisis of her own, with her very soul at stake! Without the Avengers to back her up, can the Scarlet Witch survive the night? The Day Of The Hero! 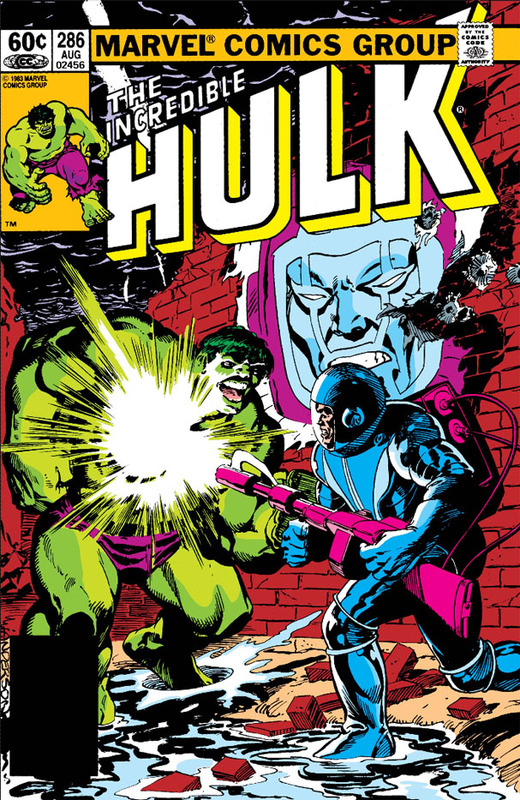 Many elements of the 1983 Incredible Hulk story, "Hero," written by Bill Mantlo, are adapted from the 1957 short story by Harlan Ellison, "Soldier From Tomorrow"--something you wouldn't have known unless you were a reader of Fantastic Universe in 1957, or had seen the story play out on the screen when Ellison wrote a teleplay for it that was featured in a 1964 episode of "The Outer Limits." If so, you would have noticed the striking similarities in Mantlo's story and, more importantly, how odd it was that the Hulk story failed to acknowledge Ellison's work at the time it was published. Given Ellison's penchant for decrying even a hint of plagiarism of his works, the adaptation by Mantlo clearly would have justified Ellison pursuing the matter further, had he wished, since it leaves no doubt as to where Mantlo derived his inspiration from. 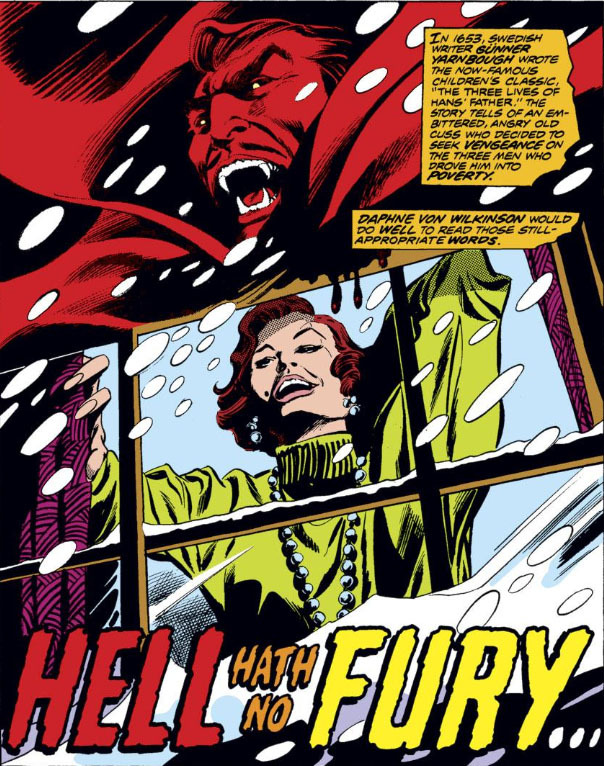 Three issues later, Marvel made a statement in the book's letters page that sought to explain the oversight and smooth any ruffled feathers. The notice is followed in small minuscule print by a virtual paper trail of details concerning the original story's bona fides--its evolution, the media it appeared in, copyright dates, production companies, production dates, and just for good measure, the name of Ellison's agent, all of which now appears very prominently on the first page of Marvel's digital copy of the issue. A "mix-up" covers quite a bit of ground, of course, since in a production sense it could mean practically anything--and a "last minute" mix-up implies that the omission didn't take place until after all eyes had signed off on it and the book was past the point of being corrected. With the apologia so lacking in details, it's impossible to do anything but speculate on the particulars; but considering that there were at least three sets of eyes on this work as it went through its development stages, including two editors as well as the writer's, it's fair to wonder at just what point Ellison's credit fell off of everyone's radar and failed to be placed on page one. Page one, mind you--the first page everyone would normally see as they review the work in its final form. 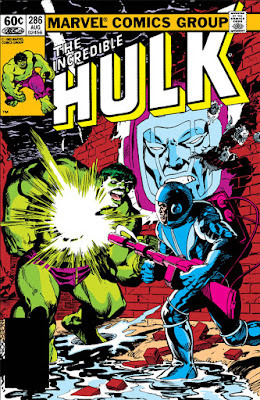 All of that said, it's interesting to see what Mantlo is able to do with Ellison's concept, and how he manages to deal in the Hulk as well as another Marvel character who seems made to order for an appearance here. 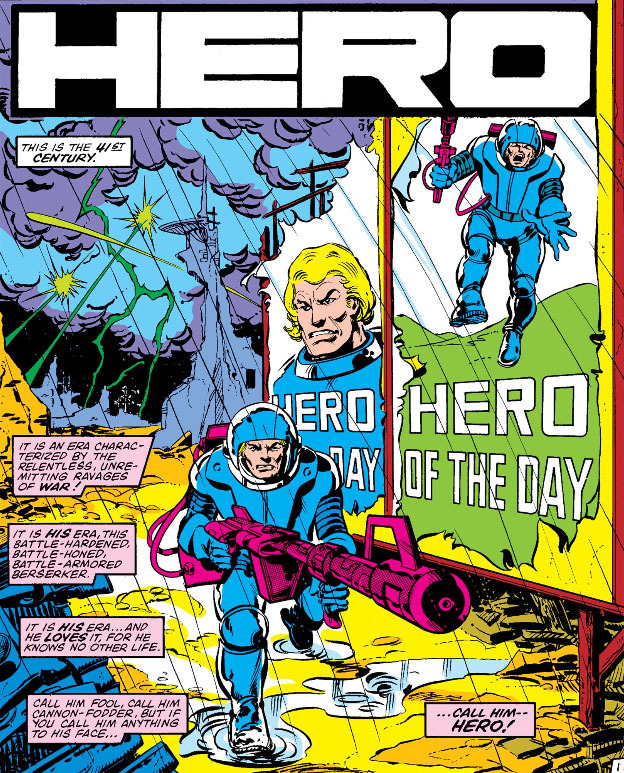 He also chooses an unusual title as this story's foundation, one that seems meant to have the story stand on its own--but how does it apply to a soldier who lives only to wage war? One Christmas, a young and gifted engineer named Virgie Hanlon was spending the holidays in her lab, putting the final touches on a project that was more than likely inspired by an incident that occurred when she was just eight years old. Virgie has grown to be capable and reasonably stable, yet also alone and isolated; and as the narrative of her story suggests, she might succeed one day in shaking off her doldrums on her own and moving on with her life. But for now, as we'll see, her talents will inadvertently unleash a very great danger in the midst of a season of joy. Yikes! It looks like the Avengers are about to get their stockings stuffed! With Roy Thomas at the helm of a book, you occasionally found yourself reading a tale that slowed the pace a bit and made for interesting reading without necessarily being an action-packed page-turner--for instance, when two of the Fantastic Four came to the aid of the Black Panther, imprisoned in an African nation that segregated its population; or when the Sub-Mariner decided to take over an abandoned prison as the first step toward making a life for himself in the surface world; or the introduction of Yellowjacket to the startled Avengers. And it's the Avengers in the spotlight once more, as Thomas introduces the infamous Cornelius Van Lunt to us for the first time, a man who would go on to become a deadly foe to the team--both in his occupation as financier/profiteer and as a member of the Zodiac crime cartel. From the looks of things, the man already appears to have the Avengers right where he wants them--in his pocket. But what's brought the Avengers to this point? They're already getting free room and board at Avengers Mansion--maybe that additional monthly stipend they receive isn't going as far for them as they'd like? Yet it's their own financier, Tony Stark, who's actually put them on the path to seeking gainful employment--because he's already crossed paths with Van Lunt, and he's come to the mansion with his hat in hand. The sum that Stark is talking about comes to $2,000/month--which was perhaps a lot of money for renting a New York townhouse in mid-1970 when this story was published, but seems like small change if Stark is looking to fend off a hostile takeover of his company. But, retroactively, the amount comes to around $120,000, which may actually date back to when the team first took possession of the mansion--so the Avengers are on the hook for a considerable amount of money. Still, that would be a pittance to a man like Stark, a munitions manufacturer with fat government contracts and no doubt a considerable personal fortune besides. 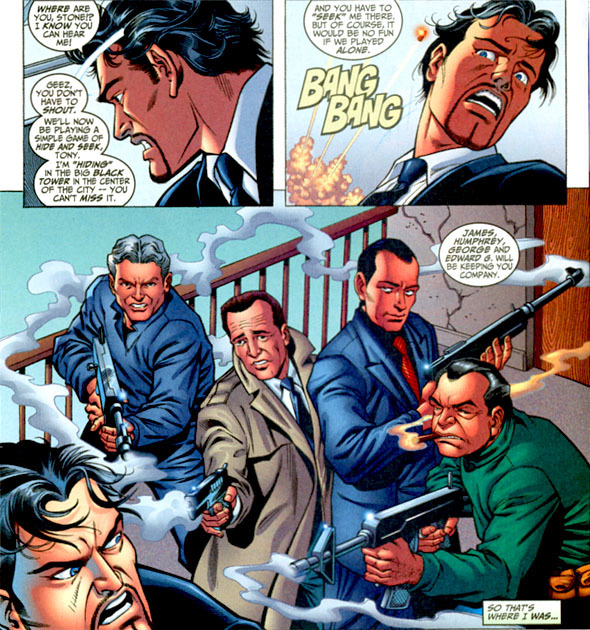 You'd think Tony Stark could duke it out in court with Van Lunt for as long as it takes, unless Van Lunt has considerable resources of his own. The Panther, unfortunately, is unable to funnel any Wakandan wealth to Stark since it's reserved for his people's own needs. (And since he's virtually abandoned his people to become an Avenger, I'd like to see him have the nerve to ask.) 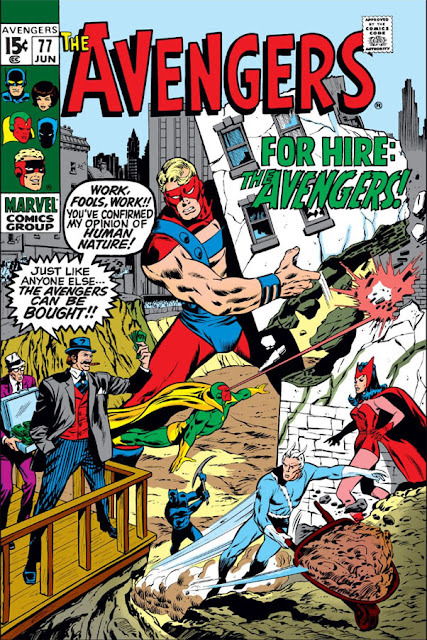 And so the Avengers put the word out that they're for hire; but they obviously haven't heard the phrase "beggars can't be choosers," since as job hunters they're almost laughingly discretionary. Yet one of the many offers to pique their interest surprisingly comes from the one man whom they'd normally turn down flat--but an offer so generous that they literally can't afford to ignore it. And so they take a meeting, and, by doing so, fall right into his hands. Will the Avengers tell Van Lunt what he can do with that cigar? Well, we've already gotten a look at this issue's cover for our answer--but what's his game? Why does he want to hire the Avengers? And by doing so, wouldn't he effectively be handing over $120K to Tony Stark? 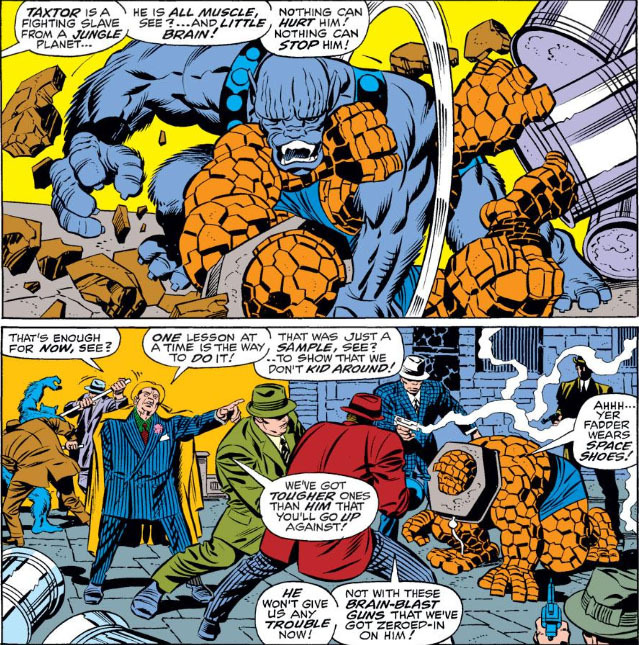 Like the Avengers, the Champions, the X-Men, or just about any other super-group whose members break out in battle amongst themselves for seemingly no good reason*, there's no doubt that the Fantastic Four have had their share of infighting. Indeed, it would become one of the hallmarks of their partnership, and even well before then, since the team's growing pains practically started from day one. And with their disagreements and squabbling and skirmishes came recurring themes in their stories that in one way or another took advantage of the drama that could be mined when members of the FF either turned against each other or simply didn't get along. You might see, for instance, one of the team quitting (or even all of them, if briefly); there were also a number of times when the Thing lashed out at his teammates, mostly due to external factors but also because he was disgruntled at being trapped in a monstrous state. *Thank goodness we don't have super-powers--imagine the carnage at, say, Thanksgiving, where our relatives already break out in hostilities at the drop of a hat. With two hotheads like the Thing and the Torch on the roster, it seemed inevitable that every once in awhile we'd see them square off, whether it was simple horseplay, an out-of-control argument, or in deadly earnest. As we can see, such clashes make for eye-catching cover art, though you'd think there would be only so many times when this kind of face-off could be dusted off and recycled. These men are on the same team, after all; at the end of the day (or story arc), they have to go back to the Baxter Building and clock in again. How many battles between them can they just sweep under the rug? 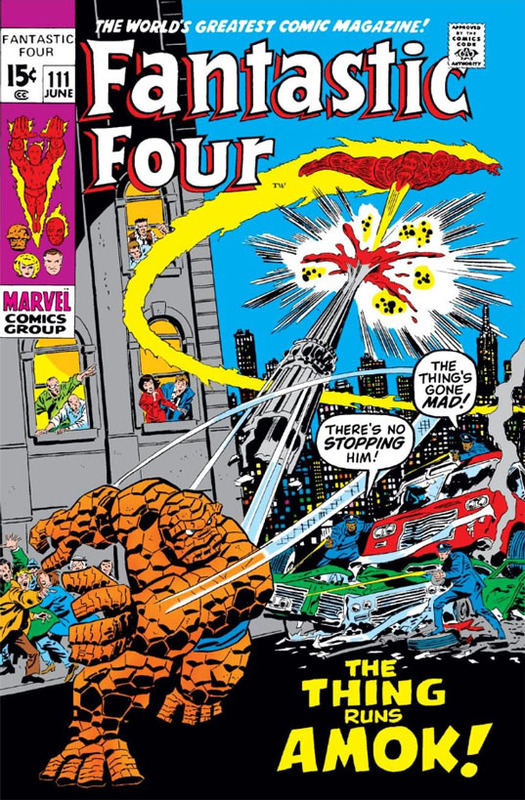 In this 1971 story, writer Stan Lee borrows a few elements from issues 68-70, once again making the Thing a danger to both the FF and New York City--thanks again to one of Reed's experiments that backfires, though there is no devious third party like the Thinker responsible for it. 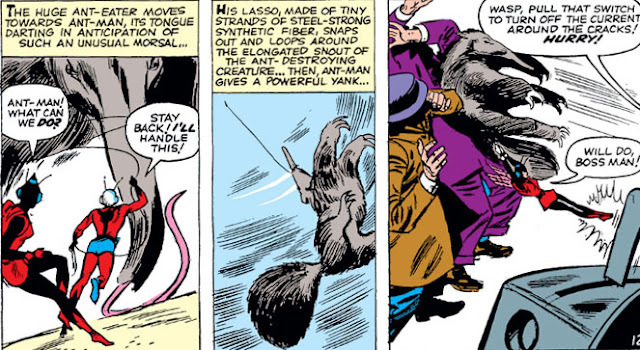 And this time, it's only the Torch who goes after the Thing, while Reed and Sue are kept on the sidelines. 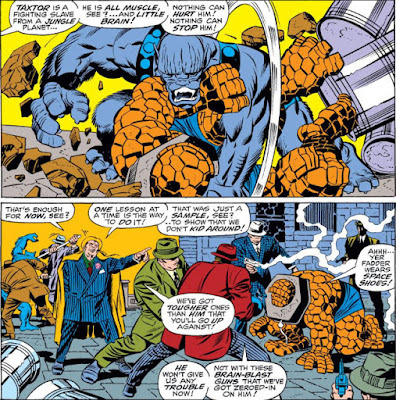 This story continues developments from the previous issue, where the Thing has successfully emerged from a procedure Reed designed that enables him to change back and forth between his human form and his rocky state at will. Yet over a short period of time, it became evident that the experiment had resulted in side effects to Ben's personality, making him progressively more irritable, impatient, and angry. Reaching a point where he eventually turns against his partners, he parts company with the FF for good and leaves in a rage. Things haven't gone too well for Spider-Man since his last meeting with Kraven the Hunter, where Kraven scored a TKO against the wall-crawler and declared victory before leaving the scene of their battle. Since then, Spidey has searched for Kraven to no avail; unfortunately, in the meantime, he's picked up a nasty bug, and been forced to take on a new menace to the city who's as ruthless and deadly as his predecessor. There's a new Vulture in town, and it's Blackie Drago, a former resident of the big house along with the original Vulture--a man on his deathbed, but who passed along the location of his flying suit to Drago before learning that Drago had double-crossed him. 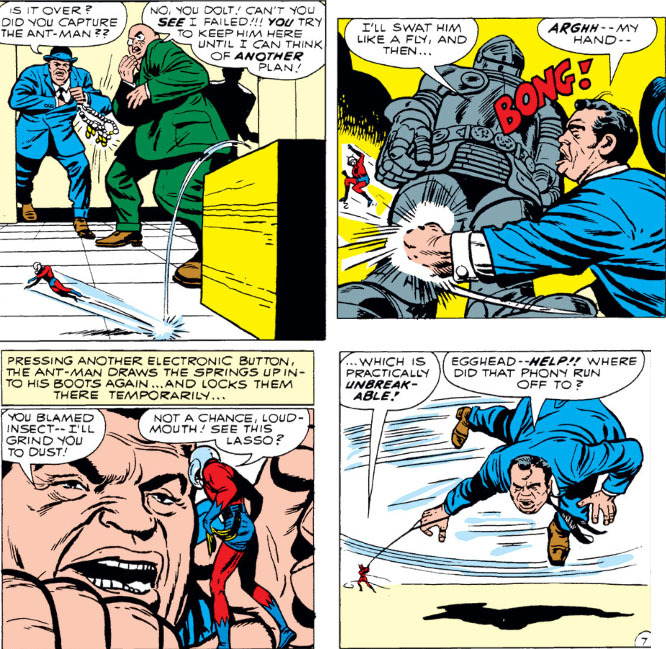 With a risky escape, Drago secured the suit and evaded pursuit--and after plunging into his new criminal career and engaging in a series of daring crimes in the city with impunity, he made sure that Spider-Man, debilitated from illness, would not survive to interfere with his plans again. 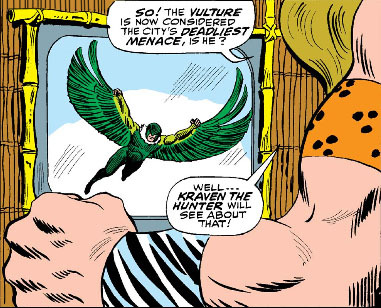 And with Spider-Man out of the way, who's left to deal with the new Vulture? 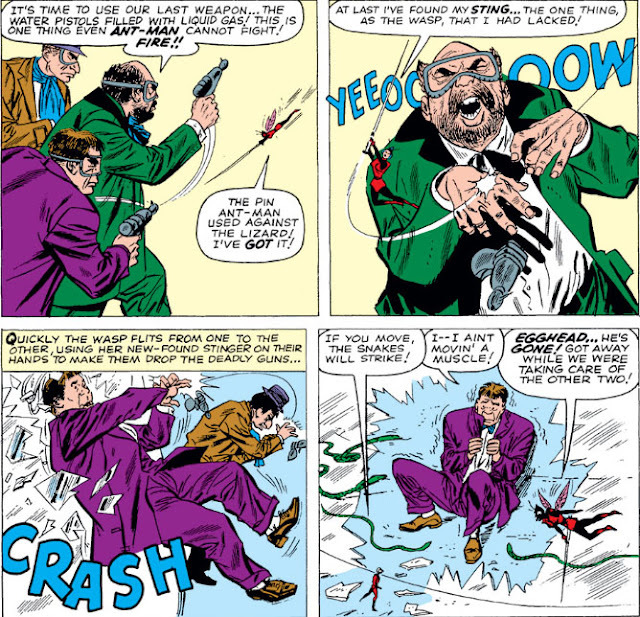 Even though Amazing Spider-Man was known for its use of unusual and at times bizarre villains, it would take some time for Kraven the Hunter to grow on me following his introduction in 1964--a man who operated by the law of the jungle to bring his prey to ground, whether those he hunted were animal or human. 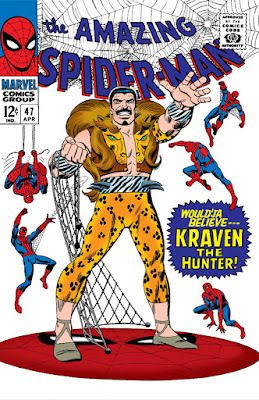 Kraven, with his potion-enhanced speed and strength and his guile at stalking and trapping his prey, was a credible enough threat for Spider-Man, though he relies on hand-to-hand combat and his single-minded desire for "the hunt" to make inroads with the reader. Kraven's main draw was his jungle fierceness as well as his deadly instincts; but what else would he bring to the table? His debut had him teamed up with a partner already, which perhaps tells you something about how little confidence his creative team might have had in his ability to catch on with readers. Yet in his third story in 1967, Kraven is unleashed by both his writer, Stan Lee, and his new artist, John Romita, as he comes after Spider-Man and our 12¢ with a vengeance. Correction: he comes after Norman Osborn with a vengeance, and as luck would have it he gets to tangle with Spider-Man while he's at it. 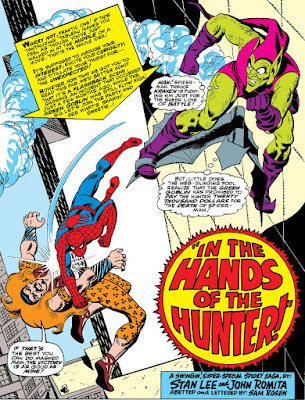 Kraven, for all intents and purposes, has been reset, with his prior two appearances having been revised to all but dismiss the inclusion of the Chameleon and instead substitute the involvement of another partner--the Green Goblin--in his dealings with Spidey. A partner that would not only eventually motivate him to chart his own course, but also to challenge the web-spinner on his own terms in a battle that would bring him to near-victory. 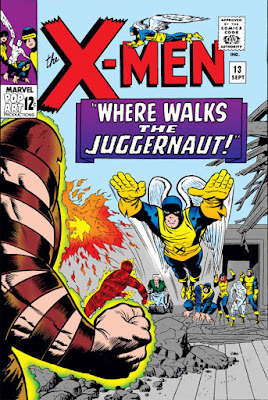 Around the time the Juggernaut was looking for a rematch with Thor, a juggernaut of comics art was wrapping up his affairs at Marvel and preparing for a well-deserved retirement from the medium--Joltin' Joe Sinnott, who just over a month ago turned 90 years young. Sinnott, who would have been in his mid-'60s at the time of his farewell, went on to ink the Sunday Spider-Man comic strip (pencilled by Paul Ryan) for King Features for the next three years, and would keep his hand in afterward by doing cover recreations and finishes. 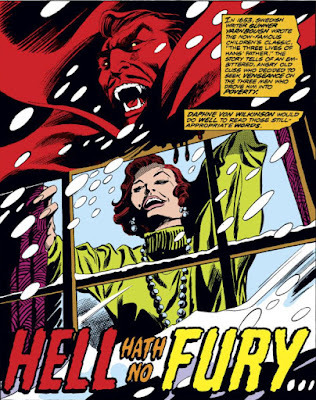 Sinnott's career spanned many, many comics titles and several companies, including Marvel's predecessor, Timely Comics. 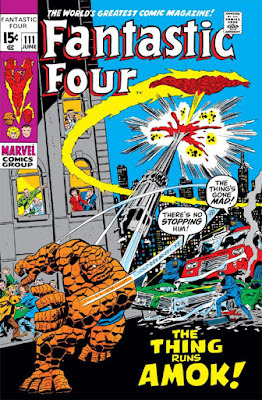 As I understand it, he first made his mark at Marvel when he took a job for Stan Lee inking Fantastic Four #5, the classic issue which introduced Doctor Doom to the world, and followed up with work on Journey Into Mystery #83 which featured the debut of the mighty Thor (as well as inking five subsequent JIM issues); but it wasn't until the mid-1960s when he would return to and work for Marvel exclusively, beginning with X-Men #13, in a continued story which presented the first appearance of (appropriately enough) the Juggernaut. 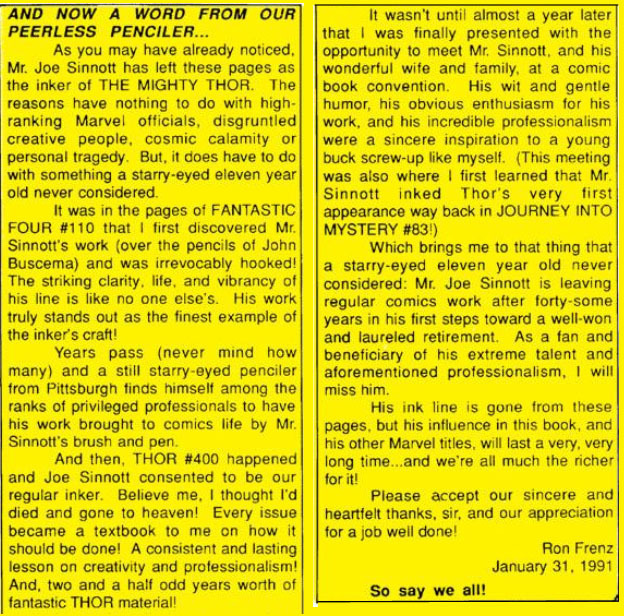 I was reminded of Sinnott's contributions to the industry while researching the PPC's prior post and came across the well-wishes of penciller Ron Frenz, who enjoyed a long run with Sinnott's polished style on the Thor title before Sinnott turned in his final work on the book. 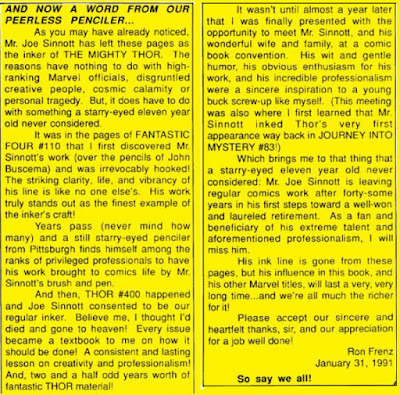 If I were to list Mr. Sinnott's well-earned accolades, from his fellow professionals in the comics medium to his many admirers who have followed his work over the decades, we'd be here all day, and it would probably be well worth the time spent. Suffice to say that I strongly echo Mr. Frenz's ardent sentiments with my own. Joe Sinnott's artistry will always be a strong part of Marvel Comics' rise to success and beyond, and his work remains a reason why I enjoy looking back on the company's line of books with such admiration. In Avengers: Age Of Ultron, there was an amusing scene where several of the Avengers attempted to lift Thor's hammer, to no avail. That is, almost. 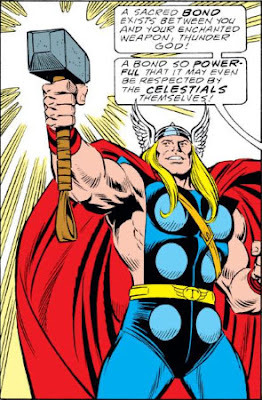 Despite how the scene played out, the jury remains out on whether Steve Rogers could lift the hammer--or at least it does for those of us who believe that Rogers could indeed have lifted it but chose not to for reasons of his own. The Vision would later have no such scruples; and just as in the comic, there may be other instances in the films where more people will find themselves lifting and even wielding Mjolnir. But when did the ball start rolling on this development? How many mortals were able to lift Thor's sacred hammer? OR: "What Goes Around Comes Around"
Two years to the month after the 1972-73 Warlock series was ended--a run of just eight issues--writer/artist Jim Starlin brought the character back for a limited series of bi-monthly appearances in Strange Tales. At that point it had been over a year since Starlin had departed Captain Marvel after revitalizing both the character and the dormant book--and Warlock, another character lingering in limbo without much direction to speak of, seemed the perfect character for Starlin to pivot to and infuse with his unique brand of storytelling and artistry. 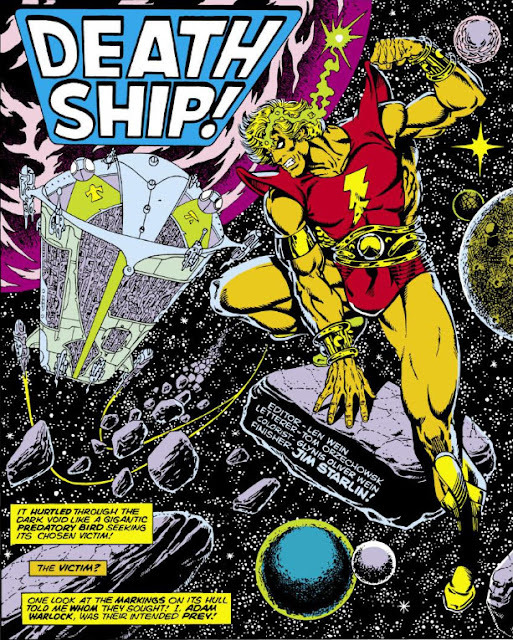 Unlike Mar-vell, however, Starlin would have Warlock based exclusively in the depths of space, having him take flight from Counter-Earth following the resolution of his conflict with the Man-Beast in the pages of Incredible Hulk and seeking his destiny in the stars. One can't help but note the irony between Warlock and Mar-vell in that respect: Mar-vell, one of the star-spanning Kree but who chose to leave behind his heritage and remain on Earth... while Warlock, created on Earth as the progenitor of a new race of man, decides to leave the Earth behind and explore his existence among other worlds and species. Starlin would be successful in having both of these men thrive in their respective adventures--yet only one of them would be at peace in their new life, having much more life experience to draw on for stability and perspective. 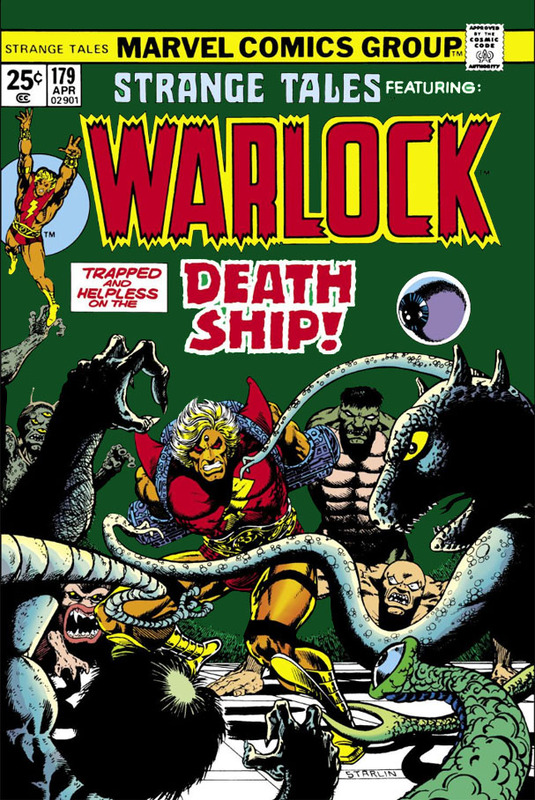 Warlock learned much of humanity while he strove to save Counter-Earth from the designs of the Man-Beast; yet his struggle to find his place in the universe would be a difficult one, and in the end he would find little solace and even less fulfillment. It's quite a different course Starlin plots for Warlock, but there is little doubt that he's the person for the job. 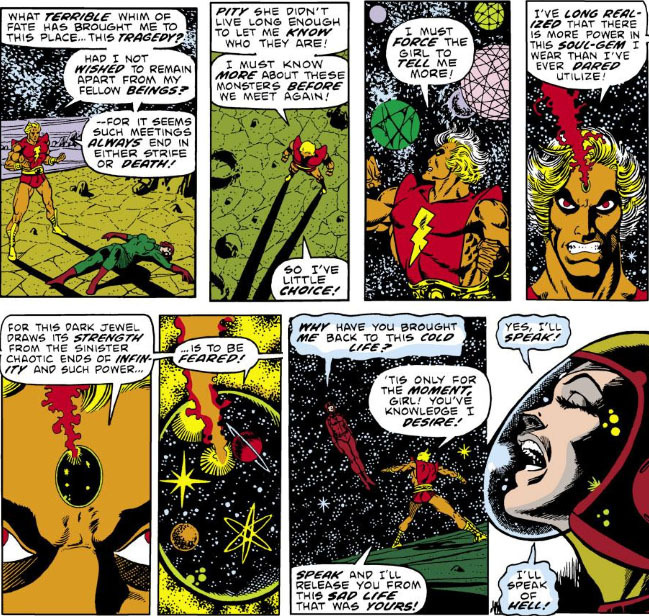 And Starlin gets to work almost immediately, following a brisk recap of Warlock's history (both as Him and as "Adam Warlock") that breaks the character from the confines of his ties to the High Evolutionary and the artificial world of Counter-Earth and sets him on a path of a journey into the unknown. But Starlin the plotter has been busy--and the character will begin a set storyline almost immediately, as he comes into contact with agents of the Universal Church of Truth, a vast empire of worlds where doctrine holds sway and heresy is met with swift and deadly force. The men, a trio of religious fanatics who call themselves the Grand Inquisitors, have been pursuing a young girl who is accused of being a non-believer of the "true faith"--and though Warlock came to her defense, the girl is slain before he could prevent it. The Inquisitors escape--yet Warlock is in need of more information in order to deal with this new and unfolding situation. To that end, he employs his mysterious Soul Gem, which chillingly reveals a function that indeed has it living up to its name. The girl describes not only the warped teachings and mission of the Church, but also the two figures at the top of its hierarchy: the Magus, a 5000-year presence who is worshiped by those of the Church and who has set it on its path of bloody indoctrination... and the Matriarch, the Church's temporal leader who took the Magus's twisted vision and ran with it, setting policy with an iron fist and making the Church the most powerful force in the galaxy. The twist to the story that Starlin offers up front is made known when the Magus reveals himself to Warlock, and discloses that he and Warlock are actually the same being. And so the odds are almost immediately stacked against Warlock: He knows that he must face and battle the Magus and his forces--yet he has almost no hope of prevailing since, if this account is to be believed, he will one day become the Magus. And as he soars onward, it isn't long before he's intercepted by a massive space ark bearing the markings of the Church--making it all too apparent that the fight has come to him. An indeterminate amount of time has passed since Dracula, Lord of the Undead, discovered that his deadly, disembodied enemy, Doctor Sun, is striking at him from within the United States--Boston, to be exact, a distance of over 3,200 miles from Dracula's current location in London. In a prior story, we saw Dracula fly in his bat form over 500 miles to Scotland to commit a murder in fulfillment of an agreement he made with a vengeful businesswoman; but now the distance he faces is too great, and he must secure conventional means of travel overseas. 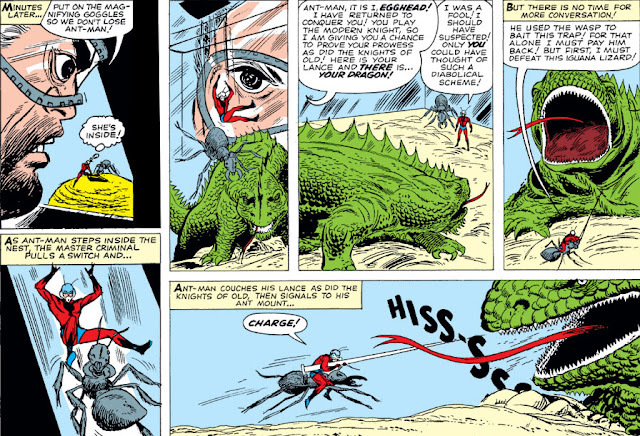 And he has little time to do so--the procedure that Sun performed while Dracula was his captive has made it possible for Sun to steadily drain his enemy's vampiric powers, and Dracula now has barely two weeks before he faces what could be his final death at last. On Dracula's trail is a group of professionals who have gathered to track his movements and assess his state of vulnerability: Inspector Chelm of Scotland Yard; psychologist Dr. Scott, who's been brought in by Chelm; and Rachel Van Helsing and Quincy Harker, professed vampire hunters who have a long history with Dracula dating back to their respective ancestors. Through them, we'll follow the trail of blood and death that Dracula has left in his efforts to reach Boston--and as this story looks backward at those events, we're given a different kind of thriller than the prior tale, where those who have crossed Dracula's path give their eyewitness accounts of the horror that seeks to make its way to America. Nothing starts off the mirthful and joyous Christmas season like a couple of back-to-back thrillers featuring the Lord of Vampires quenching his deadly thirst on hapless victims, I always say. 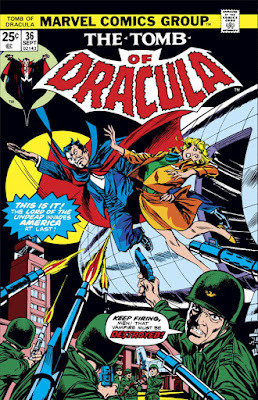 And for those of us in the States, the timing couldn't be better, since Dracula is soon to be forced to travel to America in order to put a halt to the plan of the twisted Doctor Sun. It's only recently, in a near-fatal confrontation with his old enemy, Quincy Harker, that Dracula has received information that an as-yet unnamed foe has been draining him of his powers, and that he has just two weeks before he dies a final death; and thanks to an enthralled member of Parliament, Dracula receives papers detailing a Scotland Yard investigation that confirms his suspicions that it's Sun who is responsible. And now, Dracula must race against time to find the current location of Sun, so that he may stop the process and carry out his vengeance on the floating brain. Which brings us to Daphne von Wilkinson, a fashion industry cutthroat who makes Miranda Priestly look tame by comparison. The (Truly) Terrible Traps of Egghead! 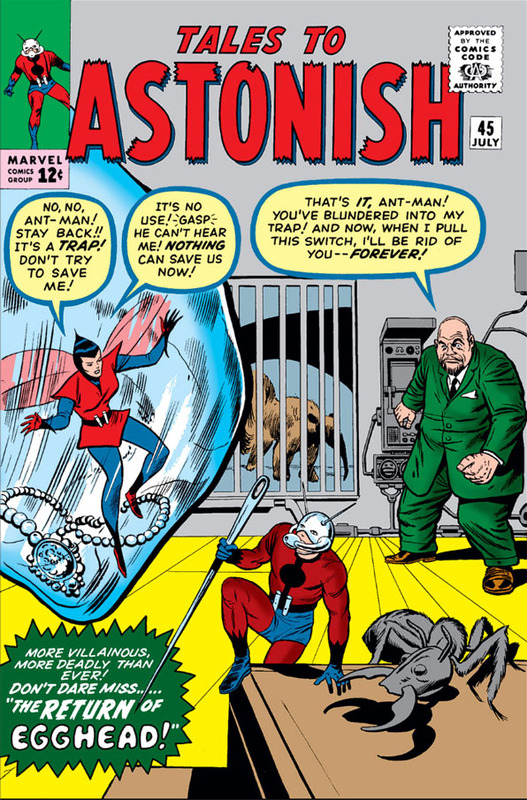 In his debut story, the criminal mastermind known as Egghead struck out in his attempt to fulfill a lucrative underworld contract to remove Ant-Man as a threat. Egghead escaped in the end, and fled to Manhattan's Bowery district to hide out (from both Ant-Man and the mob), where he seemed a broken man. But apparently a flophouse has amazing recuperative properties, because it wasn't long before Egghead was ready for Round Two with his ant-sized foe. 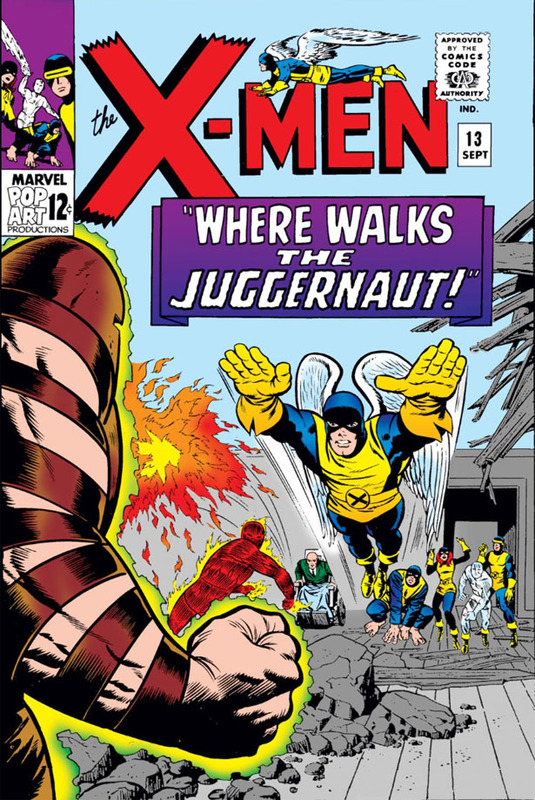 Both the issue's cover and its splash page might have you thinking that Egghead has had a bit of a makeover since we last saw him--"less bookworm, more diabolical!" you can almost hear plotter Stan Lee relay to his artists (Jack Kirby and Don Heck, respectively). But such is not the case--Egghead's cosmetic alterations are integral to this story's plot, and nothing more. 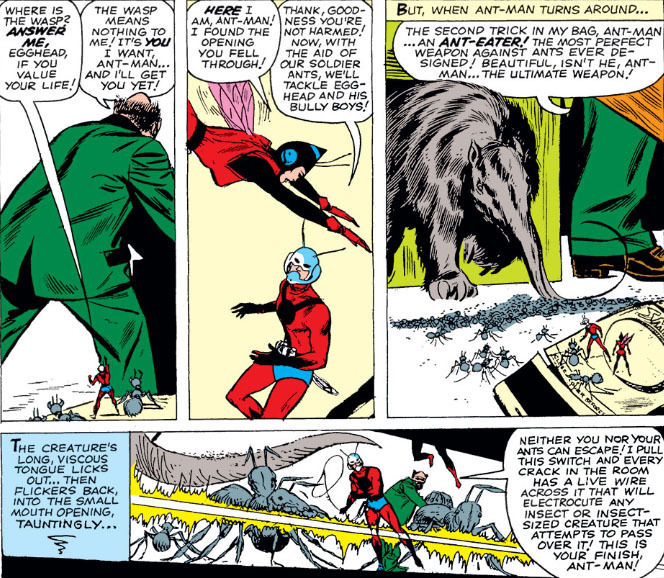 Also important to the plot is the Wasp, who has only just joined Ant-Man as his partner and almost immediately finds herself being used as a hostage. You'll definitely rate a place in Comics Heroines of the 1960s - Stan Lee edition, Jan. Instead of rope and a gag, you'll likely be seeing corked jars. Good heavens, is this Egghead we're talking about, or Lex Luthor? He's not doing badly for only his second time out of the gate, is he? 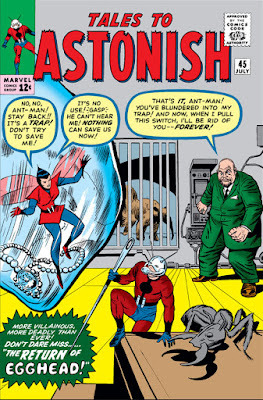 Though while we're on the subject, just a slight clarification seems to be in order: "No living man had ever defeated the sinister scientist before, except for the Ant-Man"--probably because, as far as we know, the Ant-Man is the first man (living or otherwise) that Egghead has ever come up against. Nor was it a good sign that the man's first defeat snapped him like a pencil. But Egghead's luck changes when two thugs left over from a failed criminal venture duck into the same flophouse where he's staying, and one name comes up that rouses Egghead from his doldrums. The impromptu meeting establishes a pattern of Egghead aligning himself with elements of the criminal underworld (that is, criminals who weren't foreign agents), the type of alliance of necessity that Egghead would make into a regular practice with such men in the years to come. 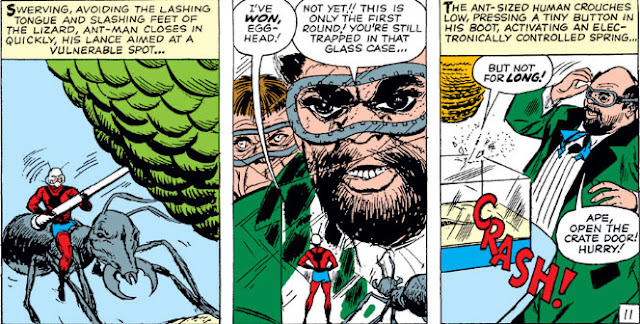 Egghead prepares a special "wasp's nest" that's rigged to capture both Ant-Man and the Wasp. Jeez. At this point I can't blame Ape and Twister for wanting to take the money and run. As it is, they've probably nodded off. As the final touches are being put on this elaborate trap, Ape asks the question that's probably on all our minds: "This is a waste of time! Why don'tcha just step on him when he shows up?" Bravo, Ape! But you have to expect that a man known as Egghead would have an answer for everything: "He's not that easy to step on, my friend!" I'm frankly astonished that even Ape would settle for such an indistinct answer--but, then again, haven't we all. 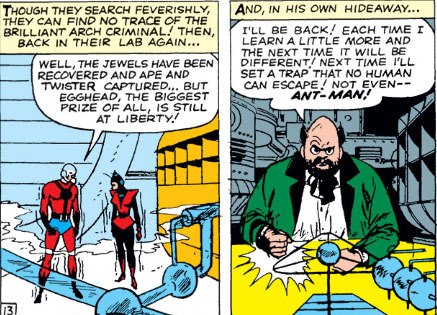 Finally, it's time to spring the trap to capture the Wasp, and the bait happens to be the diamond from the heist which Ant-Man and the Wasp are still on the lookout for. Its location? Inside the rigged wasp's nest at the exhibit which Jan attends by herself, and who appears to be the only person in the crowd to notice a priceless diamond sparkling inside of it. "Should I notify the police? No!" That's a future Avenger with NSC clearance talking, folks. Under cover of darkness, the Wasp returns to the exhibit and enters the nest, only to find that she's entered a man-made trap, instead. It seems that Egghead has thought of everything so far; and when Ant-Man arrives to investigate, he literally falls into a trap of his own, and we see just why Egghead established his exhibit in the reptile wing of the zoo. 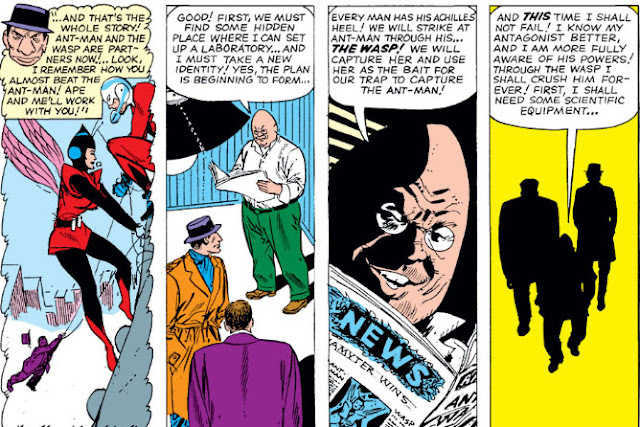 It's likely the first time any of us has seen an ant gallop, but Egghead is probably a lot more surprised than we are--especially considering what happens next, and how the tables begin to turn against him despite his careful, leave-nothing-to-chance planning. 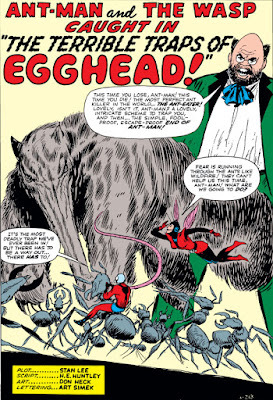 As we can see, Egghead is building quite a grudge against Ant-Man, and would eventually carry that grudge to the Avengers title as well as others. The circle closes when he finally meets his death while battling his old enemy--sneering to the end. 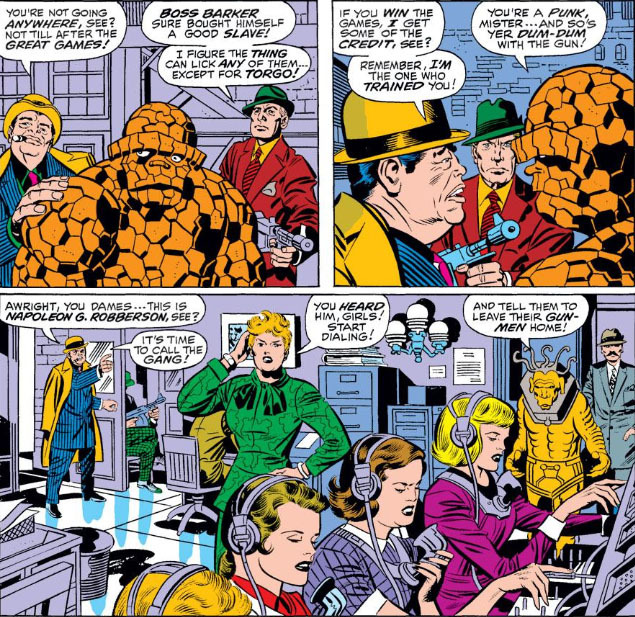 It turns out that the classic actor from Hollywood's Golden Age, Edward G. Robinson, had a few fans in the Marvel Bullpen, given the cameo appearances he's made in stories over the decades--some of them caricatures, others depicting the man himself. As we'll see, all of them represent his role as a gangster, a part he played frequently and certainly one which he excelled at. 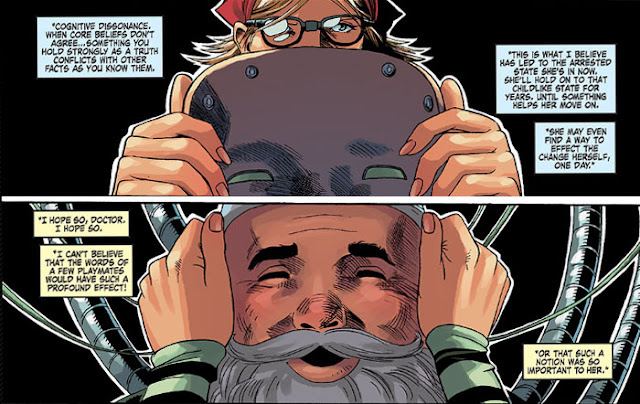 And if you're wondering what circumstances could possibly result in Mr. Robinson showing up in a comic book story--well, comic books are a fantasy/entertainment medium, after all. Suffice to say that, when Edward G. Robinson wants to make an entrance, all of the other characters had best make way for him. The examples above may or may not be a comprehensive collection of his Marvel appearances--but if you recall an appearance that wasn't among these others, do chime in with details! See?